More mining of the endless seam of mediocrity that is the dark underworld of the song poem. This gem comes from the Hollywood Artist Record Co's series of compilations Music Of America. there are literally dozens of these albums out there, all with identical, patriotic covers and all fetauring around 20 cuts from would-be hit makers. 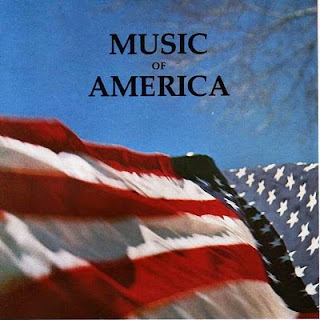 Today's track comes from what seems (judging by the catalogue number, anyway) to have been the 82nd such Music of America collection. I Can't Believe was penned by Blanche Deschamps, and 'sung' (if you dare use the word) by Gordon Storm who, on the same album, also 'performed' such soon-to-be hits as Front Page Newsy and The Fiddler's Nightmare. A less-than-thorough search of the internets has revealed bog all about Gordon I'm afraid, although I think it safe to assume he's in no way related to one of my all-time favourite song-poem performers, the Halmark stable's Bob Storm. Another submission from regular WWR visitor Ross Hamilton, the man who brought us Christmas with the daleks and, of course, the magnificently dreadful John Scott Cree. Says Ross: "I re-discovered this when I was going through the record collection the other day. My Dad bought this with a copy of the UK MAD magazine back in the early 60s (62 is most probably the right date but I cannot confirm it as the magazine is somewhere in the loft but I have yet to locate it) and it is a bit of a rarity as it is a paper record, with a playing surface similar to the flexible Lyntone records of yesteryear. This is the original cardboard ripped and it doesn't sound too bad considering it is nearly 40 years old." 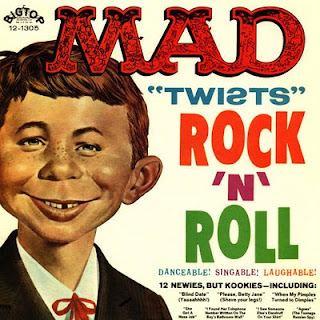 Mad, the American humour magazine, was founded by editor Harvey Kurtzman and publisher William Gaines in 1952. Widely imitated and hugely influential, although a lot of the 'humour' is probably lost on us Brits, it has satirised all aspects of life, from pop culture and politics to entertainment and public figures. The UK version of the magazine was launched in 1959 and continued until the mid 1990s. Ross' little cardboard disc (or rather square) features a cut from the 1962 album MAD Twists Rock 'n Roll, a 12 track lampoon of then-current rock and roll styles and stars, and featuring such titles as Please Betty Jane, Shave Your Legs, I Saw Someone Else's Dandruff on Your Shirt and Let's Do the Pretzel. The material on the album was written and produced independently of MAD, as a parody album, by Norm Blagman and Sam Bobrick, two men who had already scored a couple of hits between them with Elvis Presley's The Girl of My Best Friend and Ral Donner's top 10 US hit To Love Someone. Bobrick himself is now a successful playwright and worked for a time on television, writing for the Flintstones and Bewitched amongst dozens of other hit shows. 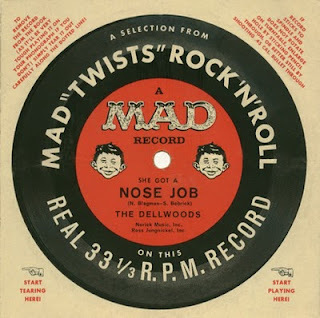 Failing to attract much interest in their rock and roll parody it wasn't until MAD became involved that the duo get managed to this released - on Big Top records in 1962. Sure they were on to a winning formula, they followed this up with the similar Fink Along With MAD a year later. Incidentally, the Dellwoods - who recorded the majority of the tracks on both albums both under their original name and as the Sweet Sick Teens - were a real group, consisting of Saul Zeskand, Mike Ellis, Andy Ventura, Victor Buccellato and Amadeo Tese. Unfortunately, before the release of Fink Along... group member Mike Ellis overdosed on drugs. The group went on to change their name to The Dynamics, releasing the 45 Chapel On A Hill/Conquistador for Liberty Records.